Star Trek:Phase II – The First Professional Fan Film? Star Trek fans can’t get enough of their favourite show. There are ten movies already, with a high profile $160 million new project on the way, 600 TV episodes, a gazillion novels and a bunch of comics. And yet, fans still want more – so they make their own Star Trek. Filmed with high resolution digital cameras on authentic looking replica sets, Star Trek: Phase II (previously known as New Voyages) takes over where the original Star Trek ended – co-opting the name that Gene Roddenbury chose for his failed attempt to revive the original series on the small screen. Playing out the archetypal fan fantasy, a plucky bunch of Trek-nerds recast themselves as their Sci-Fi heroes, facing the same jeopardy, saying the same lines, wearing the same velour jerseys and ill-fitting trousers as the original Kirk, Spock and McCoy. Phase II isn’t the only Trek fan film on the block. Star Trek: Exeter and Star Trek: Hidden Frontier are also contenders as fan favourites. Still, the “series” which has so far released four episodes, is eminently notable for the talent it attracts. Former Chekov actor Walter Koenig appeared in the Dorothy Fontana penned episode To Serve All My Days. That’s the same DC Fontana who acted as script editor on the original series and Star Trek: The Next Generation. 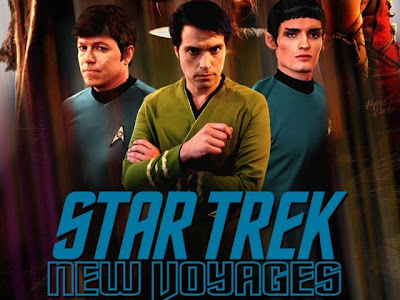 Though the first two episodes of New Voyages were decidedly shaky, with amateur acting, fan fiction narratives and poor CGI, the series came on several leaps and bounds with the Fontana penned episode. There were outstanding performances from Koenig and young actor Andy Bray, both playing Ensign Pavel Chekov. Production values rose to match the quality of the script and talent on screen. The latest entry, World Enough and Time stars George Takei reprising his role as helmsman Sulu and was written by former DS9 scribes Marc Zicree and Michael Reeves. The episode was so well received that it won a TV Guide award for best web based media – up against Lost and Battlestar Galactica. The screenplay has been nominated for the Science Fiction and Fantasy Writer’s of America’s highest trinket – the Nebula, in the same category as the Doctor Who episode “Blink” and dark fantasy “Pan’s Labyrinth”. And there the controversy begins. Now World Enough and Time director Marc Zicree has weighed in with his point of view in a statement prepared for the SFWA. The argument he constructs is interesting in itself… but what’s more interesting is how incredibly candid he is about how connected Phase II actually is. The show’s fannish producers, lead by Kirk actor James Cawley, have traditionally been tight lipped about the privileged position Phase II/New Voyages enjoys with the studio. Not Marc Zicree. He tells us that World Enough and Time was produced with the full co-operation and knowledge of Paramount and CBS (from “Business Affairs on down”), that he was given directorial advice by no less than J.J. Abrams while shooting the show and that several key personnel were paid for their involvement – including George Takei, and Zicree himself. The show had many professional crew members on board, hired by Zicree’s own production company, including a professional editor, Chris Cronin, who worked at industry rates. He lists a couple dozen more cast and crew members, each with extensive working credentials, some with Emmy and other awards to their names. He also mentions that a day of shooting actually took place on the Universal lot. This ultimately begs the question we began with; is Star Trek: Phase II/New Voyages the first professional fan film? When your free, web released movie uses copyrighted characters, but is endorsed by CBS and Paramount; when it features fans in acting roles alongside Trek alumni; when amateur producers rub shoulders with directors who worked on Deep Space Nine and The Next Generation – where do you draw the line? Here at Den of Geek we think Star Trek: Phase II could actually be the beginning of a new kind of media. The Internet brought these fans together, enabled them to build a profile and pool their resources. Now that technology is moving on and TV studios are taking notice, this fan film series has become a different animal altogether. Like Star Wars tie-in novels and Big Finish audio, Phase II is creeping towards legitimacy as a licensed product. Keith R.A. DeCandido argues against the inclusion of Star Trek: New Voyages in the Nebula nominations at LiveJournal. Marc Zicree’s rebuttal and statement for the SFWA is available in full on Lee Whitehouse’s SFTV blog.